The Carian coast (Caria) borders to Ionia in the north and to the Lycian coast in the east. With mountainous and green stretches of coastline - ranging from Gümüslük - Bodrum to Marmaris - the Carian coast has recently become the most popular yacht charter and gulet cruise area in Turkey. These sailors are attracted by the gentle sailing conditions, the beautiful bays, sandy beaches, the famous rock tombs and other historical records of the rich and ancient culture of the region. Little is known about the Carians, Homer only mentioned they spoke gibberish, and indeed their language still remains to be deciphered. 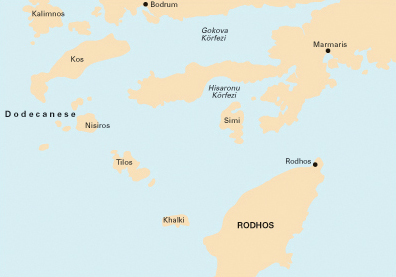 Herod assumed the Carians to be subjects of King Minos of Crete, expelled towards this popular stretch of Turkish coastline. They themselves, however, wholeheartedly disagreed and claimed an indigenous descent, in accordance with the views of modern day historians. During the Persian occupation King Mausolus (377 - 351 BCE) was appointed as an independent ruler of the Carian coast, who chose Halicarnassos (Bodrum) as his capital. Mausolus' name is now associated with all other similar tombs through the term Mausoleum.In the centuries after Alexander the Great, the Carians - as well as other neighbouring civilisations - were subject to a powerful Hellenization and as a result little remained of their earlier art and culture. The few items that survived suggest an Ionian influence; while Carians and Lycians preferred rock tombs, the tomb of Mausolus resembled an Ionian Temple. The Carian coast is much indented and is tucked in between Bodrum and Marmaris, the two largest yacht charter bases in Turkey. 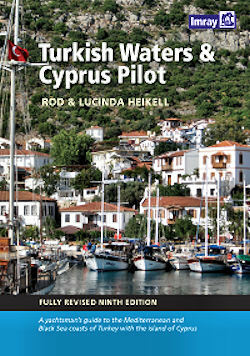 Highlights are the ports, anchorages and historical sites of Torba, Gümüslük, Cökertme, Akbük, Gökeva, Sehir Adalari, Söğut, Digirmen Bükü, Körmen, Mersinçik, Knidos, Datça, Bençik, Keçi Bükü, Bozburun, Bozuk Bütü and Marmaris. Furthermore, it is easy to cross into Greek waters, towards the Dodecanese; the beautiful islands of Symi, Kos, Nisyros and Rhodes are just a day sailing away. 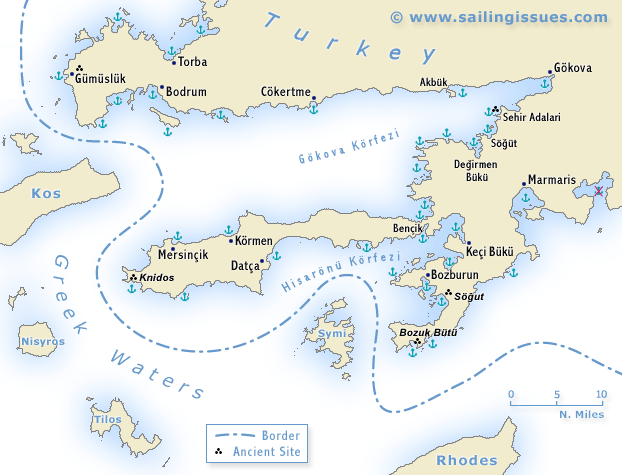 Ports of entry along the Carian coast are Bodrum, Datça and Marmaris. The Greek ports of entry are Kos, Symi and Rhodes. The normal wind in the sailing holiday season is the meltemi, which blows from the NW - WNW in open waters, but nearer to shore follows the coastlines. Occasionally, in the high season gusts can reach above 6-7 Bft. Outside the season the meltemi is less powerful and even several days of light winds could be expected. Usually the wind will pick up early in the afternoon, which is ideal for anchoring. Yet, there is the possibility that the meltemi doesn't die at the end of the day and continues during the night.